Homeschool on the Croft: Patrice's Porch... On a Tuesday! Hi Patrice! You'll be shocked when I arrive on your porch this week on Tuesday. Dearie me, I'll be there with all the other lovely folk who blog from your porch ... I'm not sure I'll know how to behave - me being so used to having the porch all to myself. After all, the other ladies only stay for one day, and I normally arrive fashionably late. * What is your favourite time of day to read? If you don't enjoy reading, then what is your favourite time watch TV/movies? I take an hour's 'lunch break' for myself most days. I have my Quiet Time then, and I do a fair amount of reading in that time. I really love reading around four o'clock in the afternoon. If I'm organized with school and with dinner preparation, I love to make a cup of tea, grab something nice, sit in a comfy chair in front of the kitchen stove, and open whichever book I'm reading. If I even get half an hour at this stage of the day, I really feel ready to get cracking with dinner, 'pieces' etc. I like to read myself to sleep too, but the Builder moans and groans about the light being on, so I hardly ever do that. I like to read if I'm waiting for an appointment, and feel dreadfully disappointed if the doctor or dentist is running on time. I don't want them to be on time ... I want to relish as many extra minutes of reading as I can! * Did you watch the Superbowl? If so, what was your favourite commercial? If you didn't watch it, what did you do Sunday night? Our Sunday nights are almost always the same. We come home from our evening service just before 8pm, and we sit and have supper. After supper, we sit and talk. We often say we wish Sunday evenings would go on and on. We don't want that time to come to an end. * Have you been watching Downton Abbey? Who's your favourite character? If not, have you seen any interesting TV or movie series lately? Strangely enough, Catherine, Katie and I were talking about this today. We have not watched Downton Abbey at all, and a friend of Catherine's, who has it on DVD, is horrified! No doubt, given that it's a period drama, it's bound to find its way into our Family Room very soon. I thoroughly enjoyed these two programmes. She is such a lovely lady, and tonight I cried when she told that their 19 year old son was killed in a car accident about twenty years ago. I hadn't realized she'd known such sadness in her life. It was so lovely to hear her speak of her husband, her 'lifelong partner' as she called him, for whom she was so grateful at their time of dreadful sadness, but also throughout her whole adult life. Excuse me, Patrice, this is Ness. Are you serious? I do love the sound of the Southern Living one though. Maybe if I ever get to the US again, I'll try and gatecrash someone's Southern living party! * Please finish this sentence: "If I work very hard, I can ________________________ "
If I work very hard at my housework in the mornings, I can sit with tea and cake in the afternoon. If I work very hard at our homeschooling work, I can sit with tea and cake around four o'clock. If I work very hard at meal planning, I will have plenty money to buy baking stuff. Then I can have tea and cake. If I work very hard and exercise, I can eat as much cake as I please. Actually, scrub that last one. I'm not sure even the promise of cake makes exercise a possibility. My favorite, of your answers, is the last one. I hope you get your tea and cake! I am so sorry that Mrs. Berry lost her son. That's a hurt that never goes away. LOL I seem to sense a theme with the tea and cake! Don't feel badly about Downton Abbey - I hadn't seen it until my son forced me to watch a few episodes at Christmas this year. And, you are right, I've never heard of Mary Berry. I love your final answer. Great! Tea and Cake sounds wonderful. I'm with you on the exercise. I don't think it would work for me either. I love how you work very hard for your tea and cake. I wish I knew who Mary Berry is, she sounds nice. Well, Downton will capture you. I like it because it is only a few episodes I think the 3rd season only has nine episodes. That way I can go onto not watching T.V. :) I really would rather do other things that watch that. I have thought about your 85 mile an hour winds. It amazes me your house can take it. Now I know why there are no trees. :) In the last episode I watched of Downton, they go to the highlands. They stay in this awesome castle. If you do watch it I would like to know if there is a place like that and if you are familiar with that castle. The scenery it just breath taking. The other night, the winds reached 112mph! Nothing moved outside, and nothing was damaged, but I hardly slept ... I went from our bedroom to the Guest bedroom and then to the Family room sofa!! I would love to hear your opinion of Downton Abbey when you see it. It looks very interesting. We heard that one of our favorite film characters "Andrew" from Warhorse, also made it onto the more recent installment of Downton Abbey. We thought the Devon accent very neat from Warhorse. Would you please write sometime about your Sabbath experience on Ness? You always seem to look forward to it so much when you mention it. I sometimes struggle not to find it exhausting rather than restful, even when I am focusing on good things like hospitality and the "mother labor" that has to go on despite the day of the week. What do you do on Saturday evenings? Sundays afternoons? What are your services like? Thank you! motivate myself to get things done. I like it all... tea, cake, book its perfect...yes, but lets exercise another day. My Mom used to sell Pampered Chef, so I get to enjoy many of those delightful products. A Southern Living Party does sound nice... I've never heard of one of those, I 'll have to gate crash one with you. 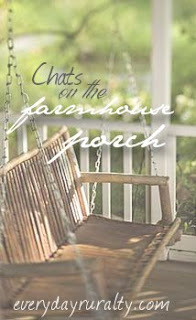 Enjoyed the Front Porch Chat. hi, hope your week is going smoothly- praying for you this week!